So, with easter passing us by, its now the start of the final term for people, a final time for me 5 years ago and so on and so forth. 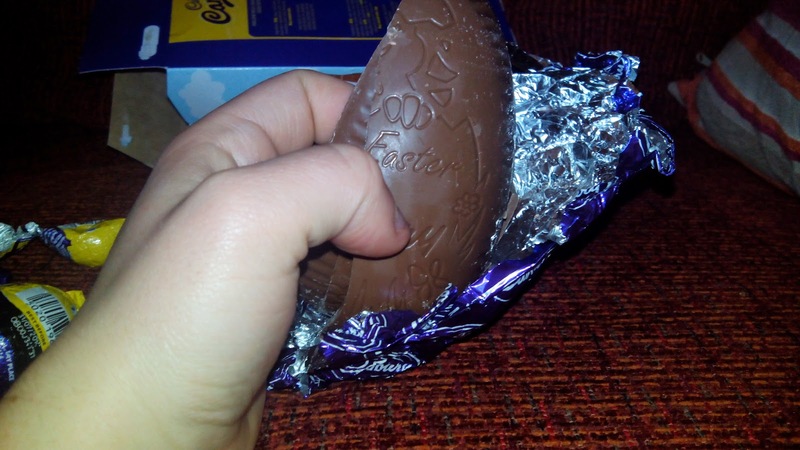 But one of the most recent traditions of easter, well apart from going on a boozing fest on the barbican, is enjoying Chocolate Easter Eggs. Sadly with some, the older they get, the less of them they have in a attempt to grow them out of it. This year, for me, it wasn't too bad and i only got one easter egg. 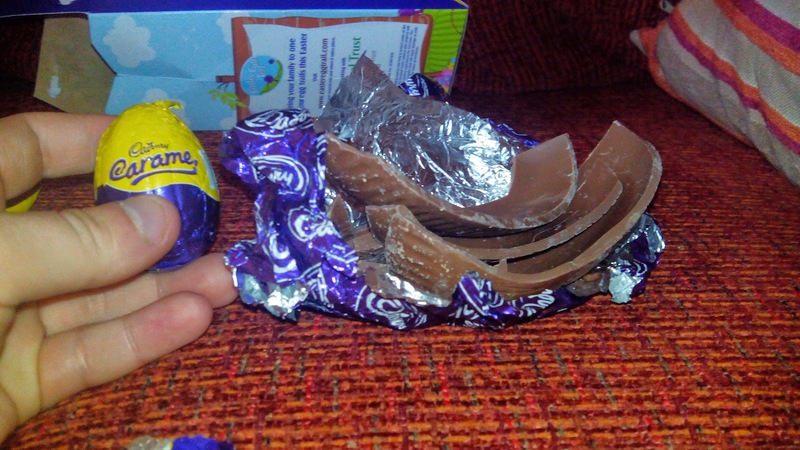 As a Easter Special, enjoy a quick review of a Cadbury Caramel Easter Egg. 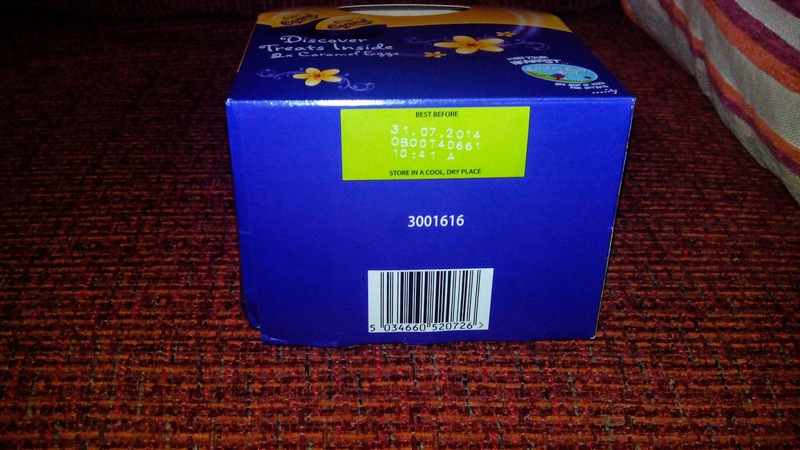 The left side of the box, just the logo and a image of the 2 eggs you get included. So, unboxing the egg wasn't as bad as i thought it would be, sometimes there is a plastic casing inside to help shape the egg, this one didn't include that and made it easier to open and get into. Of course, this doesn't make it safe against cat paws, aka aries. 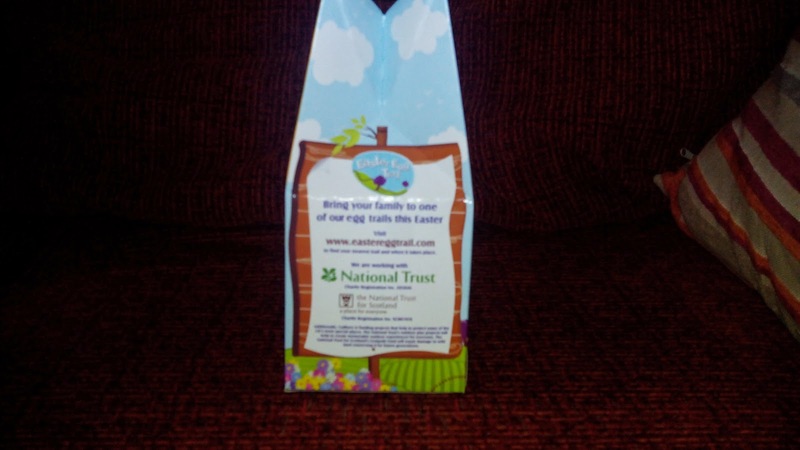 After getting into the box, it was time to eat the mini eggs first, since thats the special bonus you get with some easter eggs from well known brands. 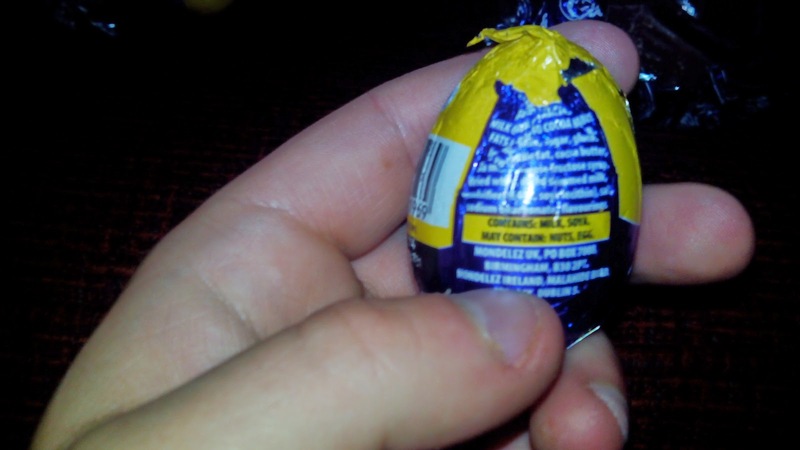 It looks a nice size, the same as a creme egg, which although might be a bit small, its made up for that by having 2 of them included to eat. 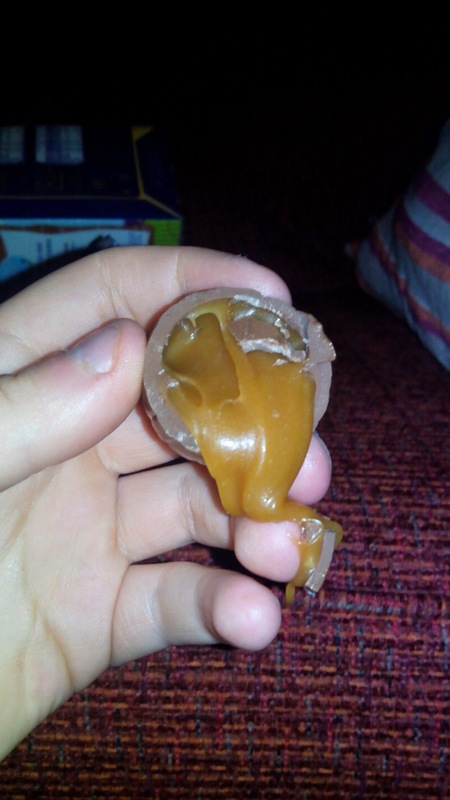 When you open the inside of the egg, a vast amount of caramel is shown and being its gooey self, and it looks amazing and tastes it too. 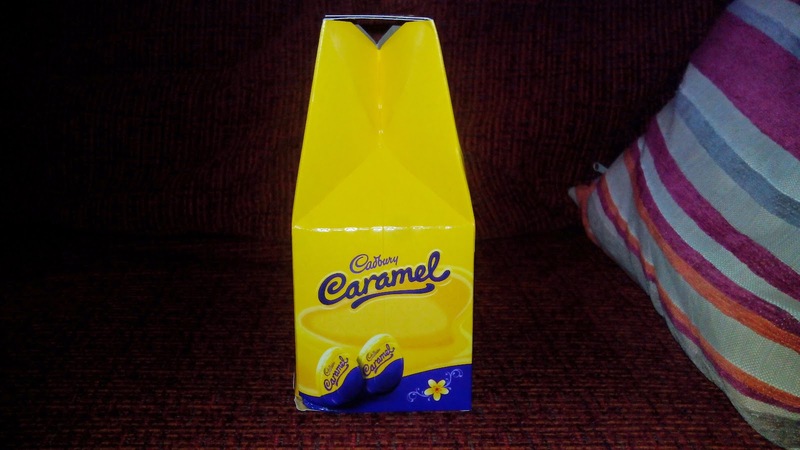 The egg, tasted quite nice, it tastes the same as a Dairy Milk bar, which of course, its the same recipe, but the caramel has a amazing taste to it, as well as its thick and juicy mixture. To be honest, this is the best i can describe it. Now we move on to the big egg.. 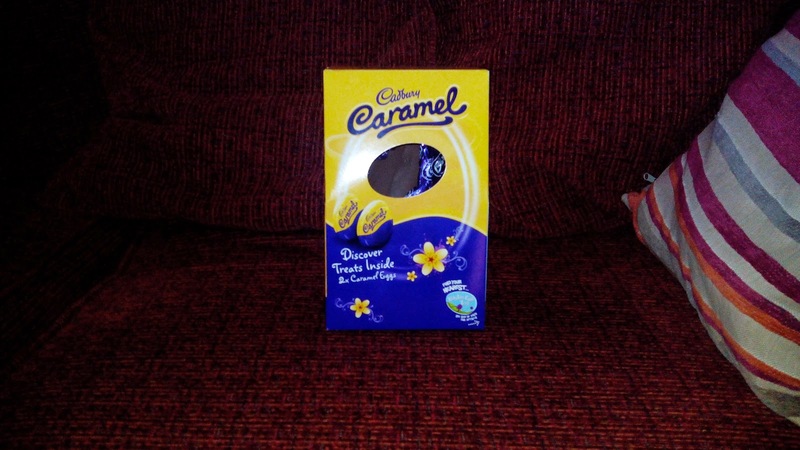 When you compare the sizes, the caramel egg is tiny compared to the main chocolate egg. The bigger egg is the more standard tradition, which is a big egg with a hollow inside as well as, well a cute happy Easter design and thats about it in terms of looks. Part of the hollow design on the big chocolate egg. 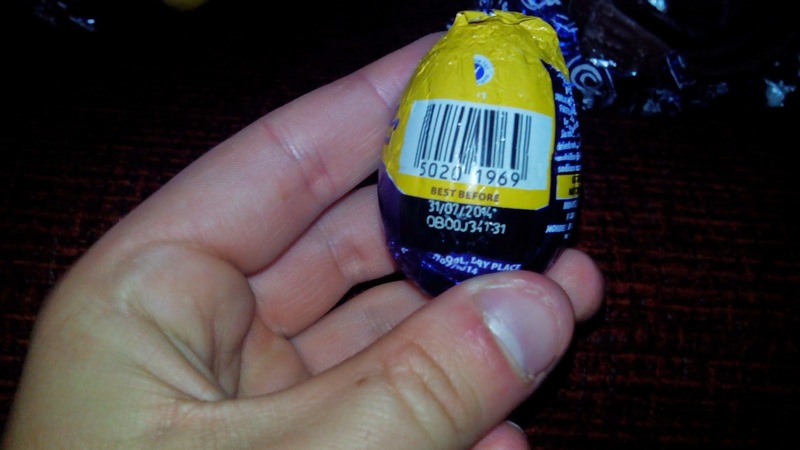 It says "Happy Easter from Cadbury" sadly, since the egg was broken, it is not possible to see the full image, but that is the jist of it. 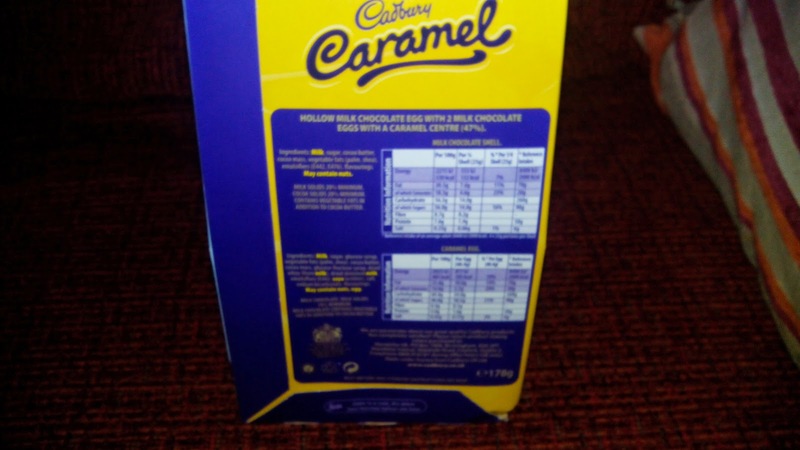 Well, the taste is the same taste as a Dairy Milk bar, which is nice but i feel there wasn't more effort put into it, but the price of easter eggs are always reflected by this. Which means eventually, eating enough of this will make you have a sickly feeling, i even had to drink halfway through filming because i was starting to feel it. 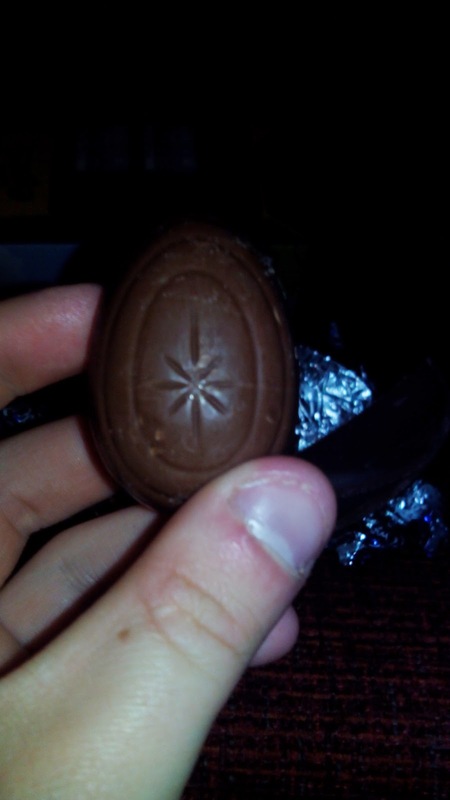 It does have a nice taste, both eggs did, even if the bigger egg is just dairy milk but shaped like an egg. There was enough to fill you up, possibly enough to give you a sickly feeling, but it depends what you had eaten before.